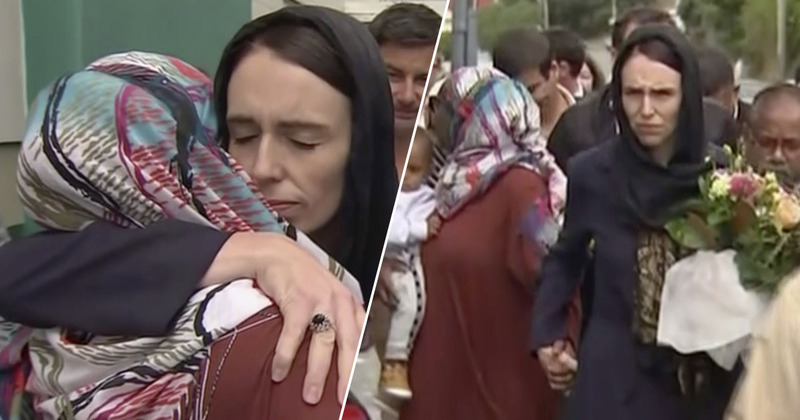 New Zealand’s Prime Minister Jacinda Ardern met with mourners this morning at a mosque in Kilbirnie, Wellington. Ardern comforted the crowds following the terror attack on March 15 which left 50 people dead, and dozens more seriously injured. The prime minister and finance minister Grant Robertson paid their respects at the mosque, laying a wreath and meeting with members of the Islamic community there. Images from Ardern’s visit have been shared on social media, with people praising her leadership, compassion and respect. What an amazing scenery of condolence, love, sympathy and harmony. New Zealand PM wore the hijab to honour the death of martyrs of Christchurch terrorist attack. You’re not only a leader but a healer too! Jacinda Ardern we love you. The face of mourning. New Zealand PM Jacinda Ardern adorns a headscarf to comfort families killed in the terrorist attack. She is an atheist, but doesn’t let that stop her from respecting another groups traditions. Be like Jacinda. Really impressed by New Zealand PM Jacinda Ardern⁩ – this is such a powerful image to send out. Meeting members of the Muslim community and already talking of changing gun laws too. Swift, strong leadership. We stand together. Ardern has vowed to change gun control laws following the attack, also revealing the alleged gunman had obtained five guns legally under a ‘category A’ licence. While work is being done as to the chain of events that lead to both the holding of this gun license and the possession of these weapons, I can tell you one thing right now. Our gun laws will change. Attempts to change the laws have previously been made in 2005, 2013 and after an inquiry in 2017. But Ardern emphasised, ‘now is the time for change’.